Boulder Neighborhood Guide 2017 | Kearney Realty Co. I realized a few years ago that people coming from out of town were having a hard time characterizing the different neighborhoods within Boulder. In response I created the Boulder Neighborhood Guide. In this report I have split Boulder into eleven different areas and present the lifestyle highlights, traffic school online california, shopping districts, local recreation and real estate statistics for each area. 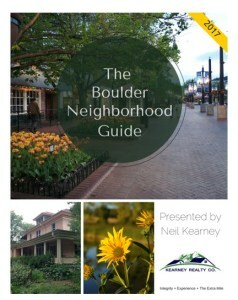 If you’re interested in learning more about the different neighborhoods within the City of Boulder this is your guide. It is recognized that Boulder is a great place to live but the neighborhoods in Boulder are a bit hard to peg. Boulder was developed over time in a piece-meal fashion. The result is that many of the neighborhoods are only a few hundred homes in size. It is common to have two adjacent neighborhoods developed at different times and with completely different price ranges. While this report is not comprehensive, it will give the reader valuable information from which to start understanding the real estate market in Boulder. I will highlight the major neighborhoods in each area.